Hey there, is there a working solution to export multiple animation takes in Maya? I saw some people had success with a purchased plugin on the 3ds Max help pages. FBX Multi Take (Maya) working with sketchfab? There are actually some non-free plugins to do this, like http://www.plasticant.co.uk/site3/?#FBXMTMAYA. The model you pointed has been exported using Motion builder. Maybe @james has some hints or useful references ? Bonus question: are animated textures currently supported/usable in a scene? Hi @tiffanychu, no animated textures, yet but depending on the case you might be able to use morph targets / blend shapes? Yep, those plugins are the best solution I have seen so far. @essimoon @mrbones @james okay, thanks for your replies! Just wondering: would it be possible at some point to get a write up tutorial for users who have Motion Builder, on this subject? Just a small step by step, maybe on how to get two separate fbx into Motion Builder and export them as takes in a way that Sketchfab accepts? I think it'd be helpful for modeler/texture artists who rarely use Motion Builder. It looks easy but we didn't give a try yet. Could you keep us in touch if works for you? We 'll probably give a try on our side as well. And yeah, you're right, this is something that could be documented. We will think about this (cc @james). - In the merge window, rename the animation so that it doesn't overlap a previous one. Note that I disabled everything in the options to the left. Thank you for the fast reply! It works fine for me. At first I wasn't sure which elements to disable, thank you for clearing that up. 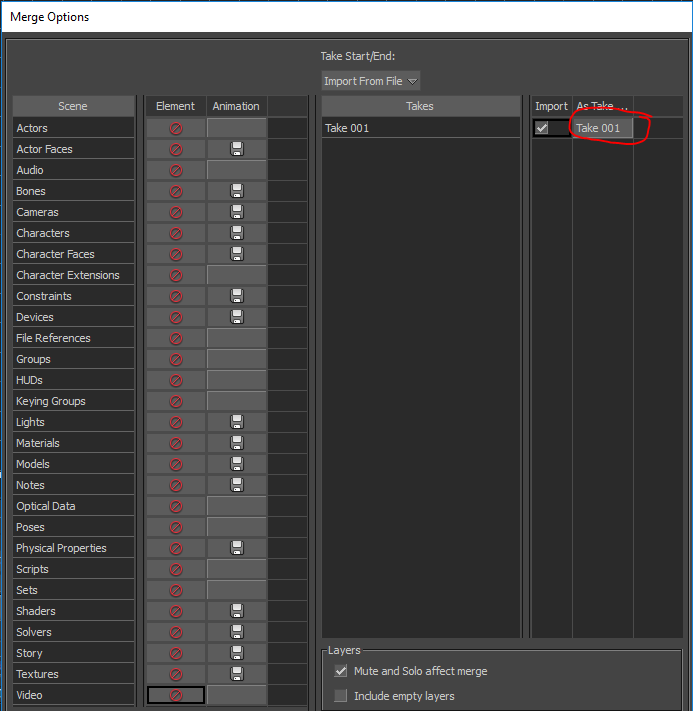 Can you please clarify which file menu you go to to find the “Merge” option when you are trying to import the second .FBX animation? Ohh wow! You rock!! Thanks so much! Will definitely use that feature! 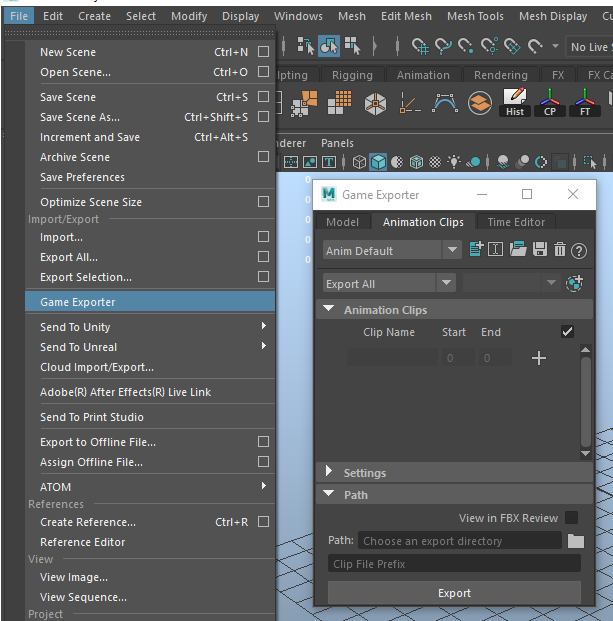 You may be able to tell I’m relatively new to Maya (though I am quite well versed in blender). I am also having a little trouble figuring out how to import animations from multiple .FBX files in Maya 2016 for editing. Then I want to clean them up and export them all as a single FBX (or use the game exporter, I suppose) to Unreal Engine 4. Can you provide any direction? Thanks so much! Not sure if that is in maya 2016, i know its in 17 and 18. Can’t remember when they added that sadly. Hello, im wondering if anyone have used FBX Multi Take (Maya) to make a FBX with muliple animation takes, that work on sketchfab? Just bought and tried Multy-Take today, it seams to work to some degree. It does display the separated tracks with the right names in the Sketchfab editor window. But it seams wonky when it comes to the timings of my animations. It leave still frames before the animations starts and doesn't seam to cut off right. Did you ever get a chance to try it out and have it working? Just as an FYI, I did bring the FBX in Unity just to make sure it was good, and it seams to respect the naming of the timing of the animation tracks. Not everyone can afford a 2000 something dollar program just to export animation tracks... I really hope there is a way to make this plugging work! So as a little update, I think I got it working. The issue was caused by my file being corrupted somehow... still haven't figured out why or how, but other characters of mine like this one work fine! So Multi-Take does work fine!